And the first post of November. One of the various events at GSoY is the design competition. Last year the theme was Charles Rennie Mackintosh. This year it was a bit different. This year it was Glasgow itself, focusing primarily on the motto and coat of arms of the city. This seemed pretty cool, so figured I should give it a go. Obviously, this was knitting on a deadline. So it had to be something which fitted the brief and could be completed by the closing date. So what did I do… I decide to knit a blanket… a colourwork blanket. See what I did. Made things complicated (especially when I spilt red wine on it while it was half done – not recommended!). But it got finished, and – drumroll please – won both first place in the design competition and also won the People’s Choice award! I also put in a second design, for a simple shawlette with lots of ruffles but based on bird’s wings. That one was rather overshadowed but I still like it. The plan now is to work on getting both patterns written up and published. 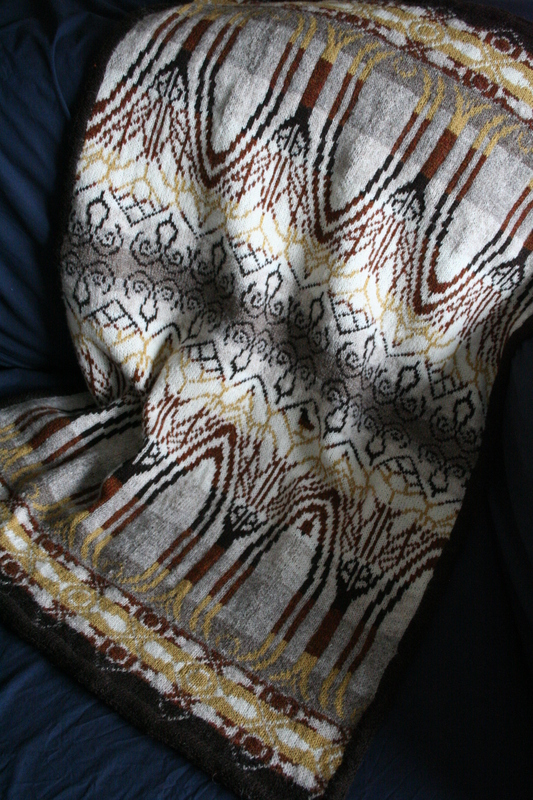 The blanket is nearly ready to go, but I want to rework the shawl a bit – I see a lot of test knitting in my future! Tags: GSoY2012, NaBloPoMo | Permalink.